Now that Mata has departed from the startling line-up of Samsung White, the team’s unstoppable run at the Season 4 World Championship is very much consigned to history now, being the last time those five players will have appeared in the server onn the same team. So where does that masterpiece of power LoL rank with the most dominant tournament runs of all time? In this series we’ll run down the 15 most dominant tournament runs in competitive League of Legends history. The ranking of the runs is after weighing up a number of facors: sheer dominance in terms of record, the level of the opponents faced and the significance of winning that tournament. 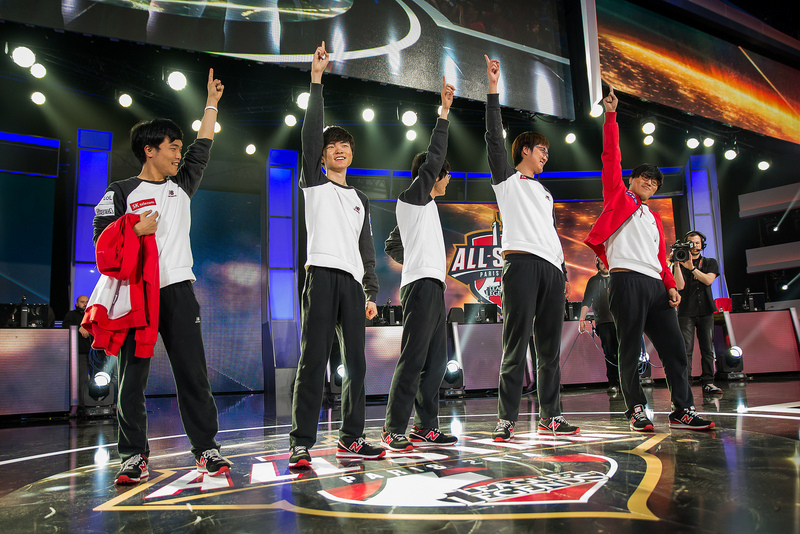 SKT looked to be the team which would make a fool of Riot’s concept in running the 2014 edition of All-Star. Where the previous year had been a straight up all-star tournament, voted for by fans, this year would feature a battle of the best team from each region, or so it was billed. The problem was, that SKT having won the previous season of OGN meant they were the representatives for South Korea, but domestically had fallen off and been eliminated by Samsung White in convincing fashion in the Ro8 of OGN Spring. Many even speculated that SKT were not a top four team within Korea, taking into account their group stage performance and their form in OGN Masters. In the end, none of that domestic context ended up mattering, they were still a Korean team at a foreign event. Faker and friends went undefeated, going 4:0 in the group stage, crushing Fnatic in the semi-final and then decimating the LPL’s leading team in the final. As if to show how far ahead of the competition they were, SKT even styled on opponents during the tournament. In the group stage they picked their full set of World Championship skins against Fnatic, ignoring the meta at some positions, and still won. In the final, they gave OMG their strongest picks in game one, only to still defeat the Chinese team in a late-game battle. With OMG mid Xiyang having been hailed as a god of Syndra, but losing on it in the opener in the final, Faker decided to school the young pup, picking the Chinese player’s signature champion to close out the series. All in all, it was a display of dominance that had many Western fans feeling depressed over the prospect of what the very best Korean teams would do to the top Western teams when the World Championship rolled around. SKT did not return to form and challenge for the OGN title again, but for those few days in Paris, bengi returned from the grave, Piglet’s twitch was a force to be recognised in the botlane and Faker was untouchable as ever. SKT’s impressive OGN Summer run meant that the two best teams in Korea would end up battling in the final of the Regional qualifier, with only one being able to attend the World Championship. When SKT took that match, in a repeat of the OGN final, OGN commentator MonteCristo declared that they would then go on to win the World Championship itself, being a heavy favourite as the best Korean team. In the group stage, OMG would upset Faker and his men initially, but that was soon put out of memory as SKT rolled over every other team in the group and then ravaged the Chinese team in a revenge match featuring one of the greatest team-play sequences in history, taking multiple towers, an inhib and half a dozen kills. After stomping out Gama Bears, SKT met fellow Koreans NaJin Sword in the semi-final. The perennial underachievers in South Korea were able to present the first legitimate threat to SKT’s chances at taking the title, pushing them to a fifth and final deciding game, but SKT dug deep and came through the moment of danger. The final was nowhere near competitive, as SKT put an exclamation mark on their claim as the best LoL team of all time, obliterating Uzi’s Royal Club in a clean 3:0 sweep that barely gave the Staples Centre crowd chance to get into the series. After their breakout performance at IEM VI Kiev in January, where they had given up only a single game, to fellow finalists TSM, M5 came into the IEM World Championship poised to become the best team in the world, with Asia still making its initial strides into top tier competition. The surprise factor of M5 in Kiev now turned to shock and awe, as the primarily Russian side were unstoppable in their march through the tournament in Hannover. Sweeping the group stage entirely, they would face their only true test of the tournament in the semi-final, against former world number ones Counter Logic Gaming (CLG). This CLG team were able to put M5 in danger of losing a single game, but M5 showed their first classic comeback, battling back into the game and taking the series 2:0. The final, against Team Dignitas, was anything but a competition, as M5 easily rolled through to the IEM World Championship title. This tournament was M5 at their most dominant. Nobody had an answer for Diamondprox’s counter-jungling, Alex Ich was a monster in the mid lane and Genja’s innovative botlane approach was far from being countered or figured out. M5 were ending games in 20 minutes and humiliating opponents, with the event being of the few in history in which the majority of the winning team’s opponents will outright admit they were powerless against the champions. This was a season that was never supposed to be on the cards for a Samsung Blue victory. SKT came in as the best team of all time, winners of the World Championship and having just recorded a flawless undefeated season in OGN Winter. With SKT faltering in the group stage and then falling to Ozone in the Ro8, it was assumed that Ozone were the best team in Korea and would progress on to take the championship. Instead, it was a Blue team who had gotten out of their group with a tied series against a flagging KTB who finished up champions. Meeting their sister team in the semi-final, Blue convincingly took the series 3:1, showcasing superior team-fighting and late-game decision-making. In the final, again many picked against Blue, choosing to go with the Save and Ggoong-powere NaJin Shield. Shield had come out of two full five game Bo5 series against KTB and Blaze, with the deciding games being breakout games for Mid laner Ggoong. In the final, Blue strategical approach would shine through, as the Samsung team shut down both of Shield’s stars, bullied the NaJin team’s ADC (Zefa) and lost only a single game before hoisting the trophy. Surprisingly, this really does rank as one of the most dominating performance in the history of OGN Champions. Taking into account its place in the modern era, with that arguably the strongest season in the tournament’s history, and then that Blue were never taken to a blind pick game, taking every series 3:1. To contrast it, one can look at MVP Ozone’s win the previous year, only to find that Ozone had their struggles in the group stage and were in the shadow of Blaze’s dominance run on the other side of the bracket, prior to the final. There is one OGN Champions performance which beats Blue’s, but their run in the Spring was one for the history books, without a doubt. The West had no clue the monster that arrived in Las Vegas in late November for IPL5. The World Elite they knew was the one which had never finished top four at any of the notable tournaments in 2012, from their solid but unimpressive Ro8 finish in OGN Summer to their shameful 5th-6th finish at IPL Face Off: SF. The crucial context to understand, is that those lackluster results had prompted the Chinese team to replace their jungler and Support player and this new look team would immediately become much stronger. At the Season 2 World Championship, they were so close to defeating CLG.EU and reaching a top four finish, but that infamous series of replayed games and internet failures prevented that scenario from playing out. Back in China, WE had begun an epic run of dominance that would continue through to next year, never losing a series offline and racking up 30+ won. IPL5 came less than two months into that run, with WE in full godmode. The Chinese titans went undefeated in a group stage featuring fnatic and Blaze. Sweeping M5 and CLG.EU, Europe’s best sides, put them through to an upper bracket rematch with the upstart fnatic team, which featured Rekkles. Adding a third straight Bo3 win over an EU team, WE won 2:1 to reach the final. Once the lower bracket had played out, it would fnatic facing them, again, in the final. Losing their second game of the tournament to the only team to have taken the first from them, WE still could not be prevented from taking the title. They were the best team in the world and for the first time China could truly consider itself a world contender. This tournament saw legendary performances across the board, from WeiXiao hard-carrying on his Ezreal in the botlane to Misaya’s vintage Twisted Fate games and CaoMei’s impressive showing against CLG.EU. Despite having been eliminated from the previous two OGN Champions seasons in the semi-final, by sister team SSB, White came into the S4WC tipped by many as the favourites. Beyond Blue, no team had had any kind of legitimate answers for White’s all-star line-up or incredible early game dominance. Having tormented SKT over and over during the year, many expected the Samsung side to tear up the rest of the world’s best. As it happened, they were right. Beginning with EDG, in the group stage, SSW showed that they were not just the best team in the tournament, but dominant enough that they could toy with their opponents. A clean sweep in the group stage led into a comfortable Ro8 match-up against TSM, who had yet to face a Korean team in the tournament. White would deliver probably the most brutal two game opening to a Bo5 series in LoL history, smashing TSM early and often to prevent any chance of the game entering the mid game with anything but victory headed White’s way. The third game saw White attempt to style on their opponents, a decision which would cost them the game, but they would take the series in the next game and move on to the semi-final. A rematch with Blue in the semi-final was far from the same story as the previous two Bo5s that year. This time White did to Blue what they did to every other team, proving an impossible riddle to solve and running away with the series. SHRC were expected to be 3:0’d in the final, but again White found themselves losing a third game, always the point in a series at which they began to display maximum disrespect in champion select. Just as with the rest of the tournament, the third game letdown could not be transitioned into anything approaching a win for their oppnents, with White taking the World Championship in the fourth game. There’s a school of thought that would suggest, with some merit, that White could have won this tournament undefeated, staking their claim for the top spot on this list, but in some senses they were more dominant as a result of their lack of respect for their opponents. The games SSW were able to style on their opponents and jump on them early resulted in some of the most impressive stomps ever witnessed in high level LoL competition. Those masterpiece massacres were more than worth the occasional game three moment of danger. Another team may win Worlds in dominant fashion, but none will ever do it in the manner SSW was able to. Having taken the OGN Summer title in 2013 and the World Championship, it was very much a case of “and for my next trick” for Faker and his legendary side. As it happened, their opus magnum was yet to come, as the Korean pick-comp masters delivered their greatest ever performance in the last OGN season of the year, accomplishing the dual never-before-witnessed feats of winning back-to-back OGN seasons and going undefeated over an entire OGN campaign. Their perfect season had even seen the team placed on the hard side of the most stacked bracket in history, with arguably the other members of the top three (KTB and CJB) in position to potentially threaten before the final had even arrived. None could stand before SKT, though. In the final itself, Faker and company impressively outclassed Samsung Ozone, recording history and marking the high point in competitive LoL history.